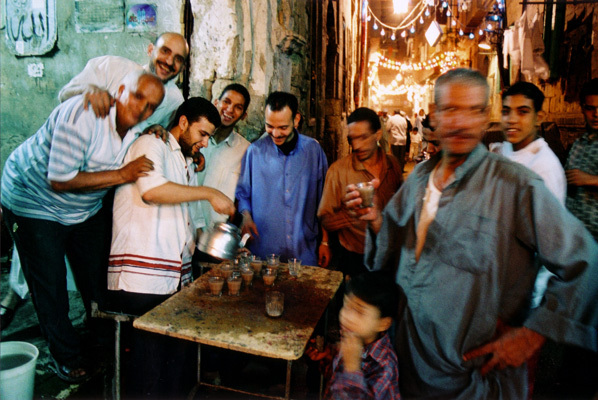 The young lawyer Mahmud distributes cinnamon tea to the passers-by at the mawlid of as-Sayyida Fatima an-Nabawiya, a third-generation descendant of the Prophet Muhammad, in Cairo. Hospitality and charity are a central part of celebrating the mawlid. Depending on their resources, people distribute refreshments, sandwiches of meals, all free of charge, to the visitors. This is called: the service for God; (khidma li-llah), meaning that it is done for no material gain but for a reward by God in the hereafter.